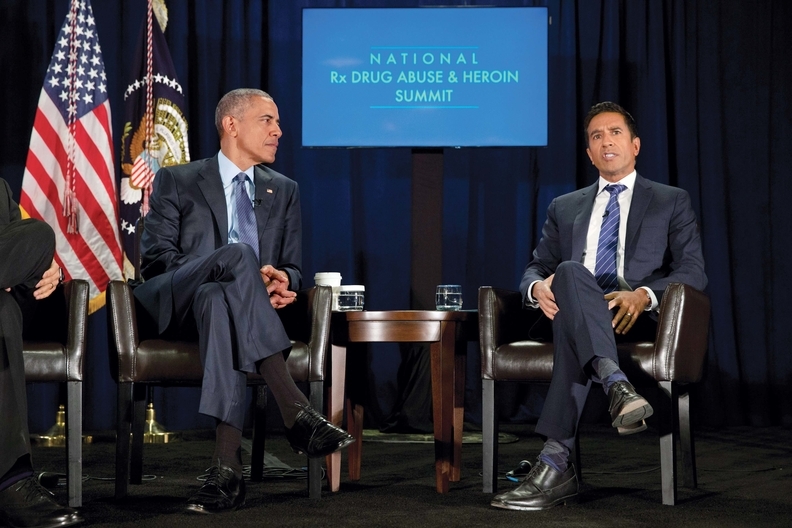 The trajectory of opioid deaths in the U.S. should be at the top of the federal government's radar screen, President Barack Obama said during a panel discussion last week with moderator Dr. Sanjay Gupta in Atlanta. Dr. Stuart Gitlow had to move his practice twice because neighboring professionals complained about the appearance of the people he treated. Other doctors say providing medication-assisted addiction recovery treatment opens them up to regulatory audits. As the immediate past president of the American Society of Addiction Medicine's board of directors, Gitlow can attest to the difficulty in caring for addicts. So he was lukewarm about the White House's newest plan to combat the opioid abuse epidemic. In a proposed rule, HHS would allow patient loads to be doubled for doctors who prescribe buprenorphine. The move to bump patient limits from 100 to 200 was met with mixed reactions by health professionals and patient advocates, who say physicians often shy away from medication-assisted treatment because they don't have the staff, the financial incentive or the patience for the regulatory burdens needed to prescribe it. In its announcement last week, the White House estimated the rule could increase treatment to “tens of thousands” of people with opioid-use disorders, but the level of unmet demand means the effort would be unlikely to save many lives. According to the National Institute on Drug Abuse, roughly 23 million people age 12 or older needed drug- or alcohol-abuse treatment in 2009. But only 2.6 million received it. The opiate buprenorphine treats addiction to painkillers or heroin with less risk for abuse, or the physical and psychological effects of withdrawal. Unlike methadone, which must be administered daily in a clinic, buprenorphine can be prescribed at a doctor's office and taken once a day at home. Approved for opioid-use disorder treatment since 2002, buprenorphine access has been limited by federal rules that require interested physicians to undergo an eight-hour training seminar. Once authorized, a physician can initially treat up to 30 patients and then, after a year, ask to treat up to 100 patients. Stigma, regulatory hurdles and insufficient payment prevent physicians from becoming certified to prescribe buprenorphine, a drug used to treat patients addicted to opioids. The proposed rule requires practitioners to have an active waiver to treat up to 100 patients for one year, and have board certification in addiction medicine or addiction psychiatry, or to practice in a qualified setting. Practitioners who want the increased patient limit must be able to offer patients behavioral-health services such as addiction-treatment counseling. They must also use patient data to improve outcomes, and participate in strategies to prevent patients from illegally giving away their prescribed opiates. Certified physicians can be audited by the Drug Enforcement Administration if their prescriptions are found to have been used illegally. Clinicians also would need to reestablish their eligibility every three years. Gitlow believes these requirements would discourage some practitioners from expanding medication-assisted treatment services. “They may not embrace it with quite the alacrity that we would all like to see,” he said. 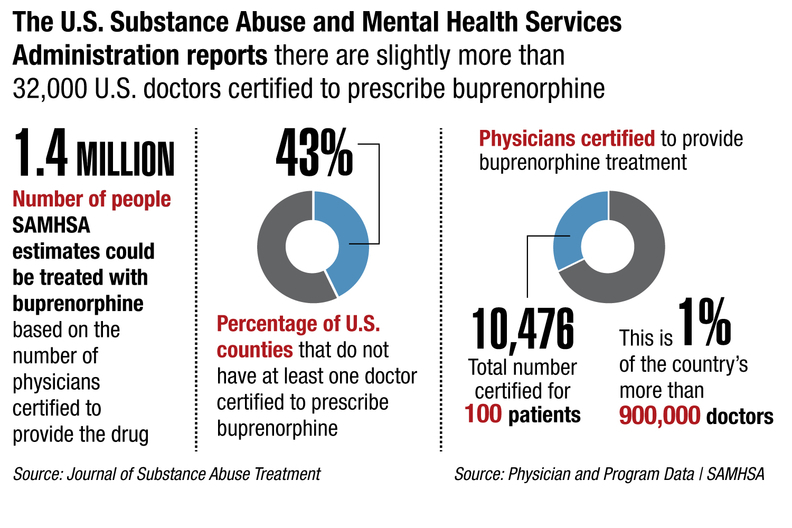 The U.S. Substance Abuse and Mental Health Services Administration reports there are more than 32,000 doctors certified to prescribe buprenorphine in the U.S., with 68% limited to providing the drug to no more than 30 patients. Approximately 10,000 doctors are certified to prescribe buprenorphine to as many as 100 patients. They represent just over 1% of the country's more than 900,000 actively practicing physicians. A December 2015 Huffington Post analysis found that nearly half of the nation's 3,100 counties do not have a doctor certified to prescribe the drug. Dr. Hilary Cannery, Area 1 director for the American Academy of Addiction Psychiatry, and assistant professor of psychiatry at Harvard Medical School, said the proposed requirements should not deter physicians. She said the real problem comes after doctors get authorization. “A lot of physicians are very uncomfortable with the idea that they are going to be assuming the risks for managing these complicated patients when they don't have enough therapists or group counselors, or even administrative staff to keep up with monitoring,” she said. Another hurdle has been payment for treatment, which Cannery described as “notoriously awful” from private payers, as well as from Medicare and Medicaid. The drug often needs prior authorization. The Affordable Care Act requires health insurers to cover 10 essential health benefits, including prescription drugs and substance-use disorder services, but it has been unclear whether plans on the federal marketplace have to cover the full range of medication-assisted treatment. Cannery said progress is being made toward improving physician payment for medication-assisted treatment, but more work is needed to create a structure that will sufficiently support patient care for addiction recovery. Physicians, social workers and consumer advocacy groups have pressured the CMS to require all health plans sold on the federal exchange to cover medications used to treat people with opioid addictions. Along with raising the patient load cap, the White House also bumped funding to federally funded community health centers by $100 million.